As many of us at Zodiac Heating and Air Conditioning have been personally affected by the Woolsey fires, we know that there’s a lot of work to be done once the mandatory evacuation orders have been lifted. If your home has experienced partial fire or substantial smoke damage, you’ll most likely need to thoroughly clean your home in order to clear it of all fire-related debris and toxins. While a fire remediation company can remove smoke and soot from your home’s ceiling, walls, floors, and furniture, it’s best to work with a heating and air conditioning company to clean your central HVAC’s ductwork to ensure that you don’t re-contaminate your home with soot, ash, or smoke odors, after its been cleaned. Call Zodiac HVAC for safe, effective, and thorough ductwork cleaning services. 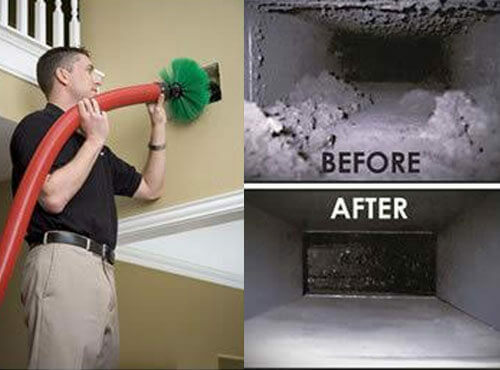 With more than 30 years of experience and thousands of satisfied customers, we’re confident that we can give you the highest quality ductwork cleaning services, and make the entire process as fast and easy as possible. We thoroughly clean and sanitize ductwork. Using Rotobrush’s rotating brush and vacuum system, we’re able to effectively loosen and safely remove fire contaminants, such as ash and smoke particles as well as mold, fungi, bacteria, and dust throughout your ductwork. Additionally, we also use fogging equipment to kill germs and prevent mold and bacteria growth. All work is done safely and carefully by trained technicians using a HEPA filtration system to keep the environment clean throughout the process. We’ll go above and beyond. Every duct cleaning includes a free air filter, an evaporator coil check and cleaning, and a safety inspection of your heating and air conditioning equipment. We will work your insurance company to handle your ductwork cleaning claim. We know you’ve been through a lot, and do our best to make the process as easy as possible. If you provide us with your insurance information, we’ll contact the insurance company on your behalf, get approval for the work we will be doing, and arrange to receive payment directly from them. Call Zodiac Heating & Air Conditioning today at (818) 465-8943 to schedule your duct cleaning service in or near Calabasas or Malibu. We have local crews dedicated to handling duct cleaning requests throughout Malibu, Calabasas, Bell Canyon, West Hills, Hidden Hills, Agoura, Oak Park and surrounding areas, for quick response times. Call now to schedule an appointment.